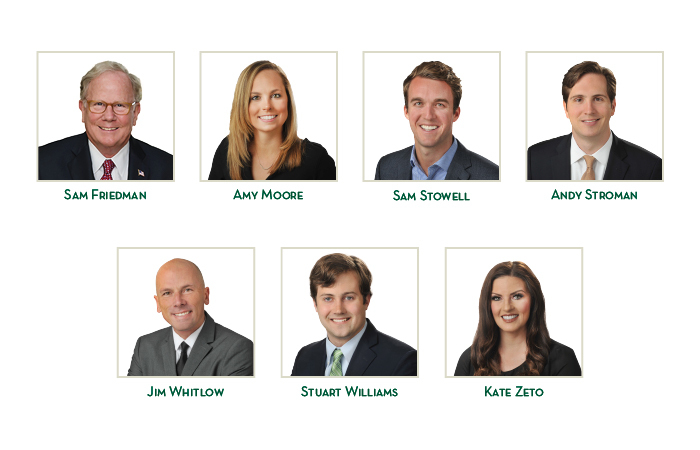 We have added seven Realtors to our ever-growing team including Sam Friedman, Amy Moore, Sam Stowell, Andy Stroman, Jim Whitlow and Stuart Williams. They run the gamut from a legend of Atlanta real estate to a former NASCAR marketing executive to a retail guru. We are thrilled to welcome them to Dorsey Alston, and hope you’ll take some time to say welcome and congratulations. As always, they are on call to help you find your dream home and to market your current residence. Sam Friedman is joining his son, Geoff, at Dorsey Alston Realtors. During his storied real estate career, he earned four major professional designations; CCIM, CPM, SIOR and CRE. AFCO Realty, the commercial real estate firm he founded in 1971, will continue to operate and Friedman will remain managing broker. Friedman is the founding chairman of the Board of Directors of the PATH Foundation, a prior member of the Atlanta Housing Authority Board and a past chairman of the Atlanta Union Mission. Amy Moore has a background in public relations and social media, which will serve her clients well when it comes to marketing their homes. She is a graduate of Blessed Trinity High School and the University of Georgia, where she earned a degree in public relations. She is focused on customer service and prides herself on her attention to detail. Sam Stowell has represented a multi-family portfolio ranging from quaint studios to luxurious penthouses and has a knack for finding a home for any client. His experience living in Australia, Belgium, Louisiana and Texas, has made him realize the importance of being able to call your current location “home” no matter if it’s for a short or long term. He is adept at understanding his clients’ most important preferences and finding a property which meets those needs. Andy Stroman is a member of the Atlanta Realtors Association, Georgia Association of Realtors and the National Association of Realtors. He comes to Dorsey Alston from the world of professional automobile racing, where he sold corporate sponsorships for NASCAR. He also spent several years servicing group insurance, where he developed an expertise in contracts. He is a graduate of Holy Innocents’ Episcopal School and the University of Georgia. Jim Whitlow served as Store Director at Jeffrey in Atlanta and New York for 17 years. He then opened his own luxury athletic store, DEKA, in Atlanta, Chicago, and New York City. He operated those stores for nine years, building a loyal client base. He values personal relationships with clients and has an fine-tuned ability to customize for your specific needs. Through his experience in the luxury retail sector, he has developed a strong ability to help customers find the perfect fit for them. Stuart Williams prides himself on putting the client first and going above and beyond to make sure their needs are met. He values clear communication and puts in the time and effort to build trust and candor in his work relationships. Prior to joining Dorsey Alston, Williams worked in client relations for the advertising company Tytan Creates, where he worked with a number of regional and national clients helping them to build their business through precise brand development and innovative awareness campaigns. Kate Zeto ran the title company for the largest developer in southwest Florida, Barron Collier Companies, and has served as a certified real estate paralegal in Atlanta for the last five years at prestigious law firms including Morris, Manning and Martin and Seyfarth Shaw. Over the course of her career, she has closed hundred of residential and commercial real estate deals.